Plenty of period revival homes grace the north shore. Yet a sadly large proportion of them draw on Classical influences, a sad reflection of America’s adolescent growing pains, in which the far more interesting (in your humble narrator’s opinion, at least) Gothic and associated styles were passed over in favor of dime-a-dozen, staid, stolid, snoozy Greek influences. For that reason, this batch of period revivals along Tower Road stands out in particular. The centerpiece is this brightly colorful, cheery home, of striking gables. It is surrounded by a trio of homes in a comparatively rare style, which doesn’t seem to go by any one name. 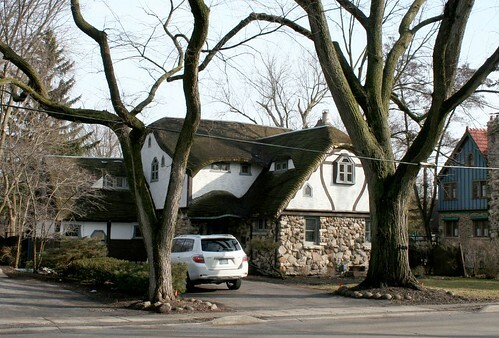 It’s not truly Tudor Revival; “English Medieval Cottage” is more a description than a name. “Cotswold Cottage” includes some houses with that same sort of wavy, curvy-cornered, crazy simulated-thatched roof, but it doesn’t seem to be requisite to the style, whereas I would call it the defining element of these homes. 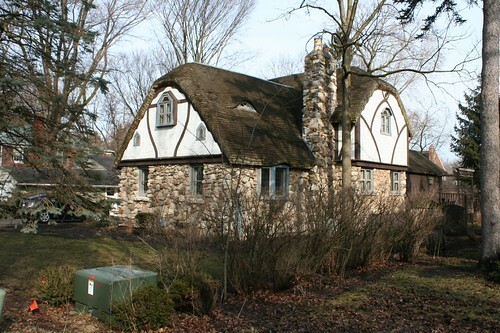 “English cottage” or “Medieval Revival” might be as close as you get. One expects to see Hobbits coming out of their charming confines. 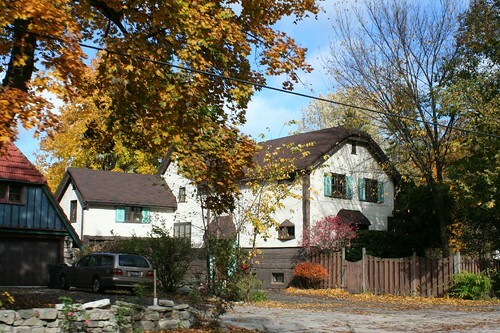 Edit: After some further research, these three are Storybook Style houses. Unsurprisingly, given their charm, there’s a whole web site and even a book devoted to Storybook architecture. The author, right up front, shares my assertion that there should be Hobbits on the premises. Whatever they’re called, they’re fantastic, a treat for the eye. These three also have a cousin a few miles south, in Evanston. This entry was posted in North Shore. Bookmark the permalink. I'm so excited to learn that there are other homes like this in the area! I used to live in Oak Park and stumbled on this cottage-style home at the corner of Linden and Superior… I was never able to find anything out about its builder or occupant, but it has a remarkable roof like those in the photos you've posted.Here are a couple I took of the property:http://photos-d.ak.fbcdn.net/photos-ak-sf2p/v135/29/98/28500246/n28500246_30854915_5905.jpghttp://photos-f.ak.fbcdn.net/photos-ak-sf2p/v135/29/98/28500246/n28500246_30854914_5659.jpgGreat but unusual style. Whoa, great find! Thanks for sharing.More terms I've come across to describe this style: Irish cottage, medieval thatched roof, or just simulated thatched roof. More names: Storybook style, English Cottage style. I may be making this up or have dreamt it, but I seem to remember an architecture history course where the professor theoretically attributed Storybook Style's popularity to cinema. You see a lot of this style in the 1930's-40's in LA, at the time when movies like Snow White were coming out, when Americans were being reintroduced to European history through movies.Anyway, great post. thanks for this sharing! In my opinion, The Witch's House from Beverly Hills should be included here. It's one of the Beverly Hills' unique sights. It gives the impression that Hansel & Gretel lived here! The house belongs to a real estate agent, Michael Libow and it's not open to the public. I grew up a few blocks away from those houses. They have long been considered local landmarks. From what I learned in local histories, they are all Swedish style, each one done in the style of a different region of Sweden. 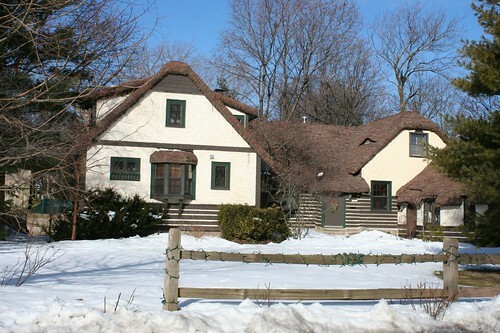 Winnetka once had a fairly significant Swedish immigrant population, and one decided to honor his homeland by building those houses. The one with the snow in the picture has a significant addition, put on about 20 years ago. They did a remarkably good job of making it fit the architecture of the rest of the house. 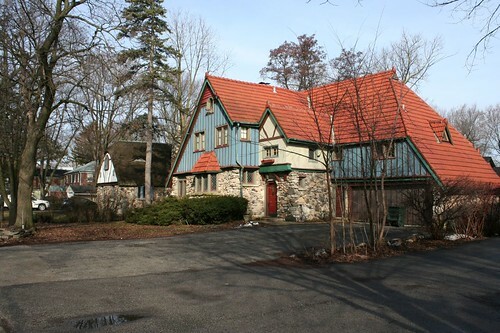 My grandfather, William N. Cramer was a contractor who worked with architect R. Harold Zook. 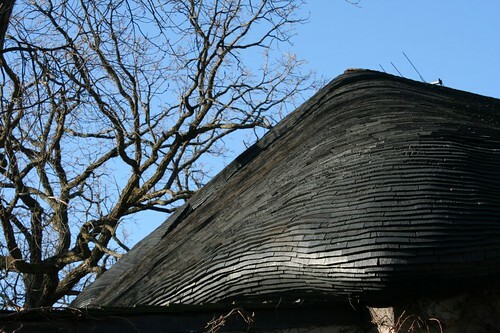 He was granted a patent on the methodology of creating these roofs by the Federal Government in 1931. He did them throughout the Chicago area during the 1920s-1940s. 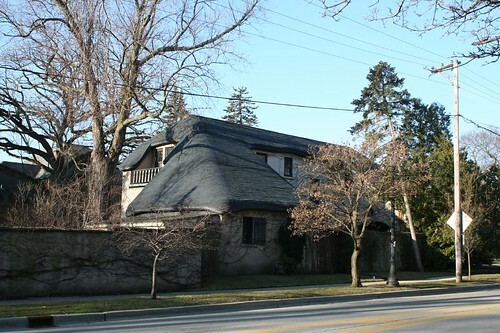 His son, Richard Cramer, became an architect, and continued doing these roofs throughout the 1950s-1960s, but became a losing endeavor because their quality homes were too labor intensive in comparison with the suburban cookie cutter homes. 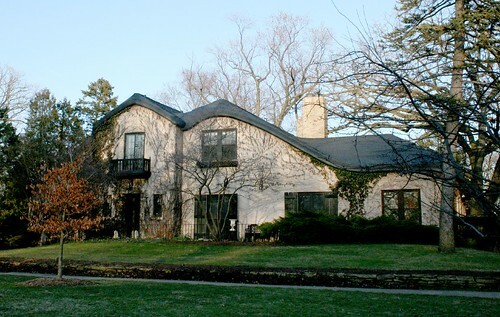 There business was titled “Roof Thatcher, Associates” and were located in Hinsdale. If you have any additional information, I would greatly appreciate it.